I would love to hear from you. If you see something here that you'd like to know more about, please contact me either by email at CAROLFOG AT SIGN SPRYNET DOT COM. Or you may call me at +1 703 598 1441. If you wish to order a painting, print, or a set of notecards, I accept all major credit cards and Paypal. There may be a nominal shipping fee, which I will quote you when I know to where I am shipping. I also glady accept commissions. If you have a special place, I'd love to paint it for you. I have done this many times for people and it's always been a wonderful experience. Please contact me with your idea and we'll discuss the details. 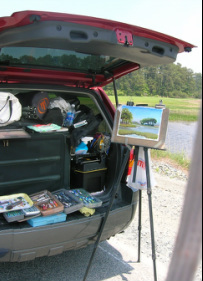 Painting from the back of the station wagon at Chincoteague Island, Virginia! I had just finished doing the Boardwalk Arts Festival in Virginia Beach when I thought I would stop by to see what the wild ponies were up to. The day was hot and the mosquitos were ferocious, but that didn't stop me from painting up a storm.